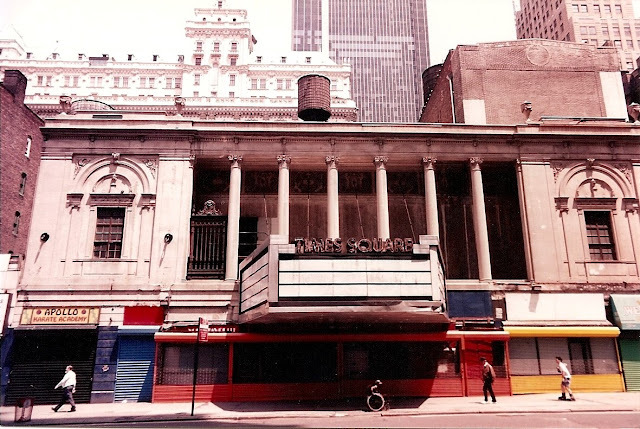 The Times Square Theatre opened to the public on September 30, 1920, with the play, The Mirage. The play, Gentlemen Prefer Blondes, was performed 199 times in the 1926-1927 season. 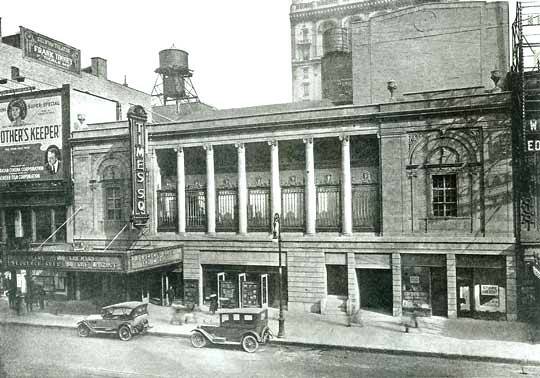 George Gershwin's, Strike Up the Band, played in 1930. In 1931, the hit comedy, Private Lives, starred Gertrude Lawrence, Laurence Oliver, and Noel Coward, the playwright himself. After closing in 1933, the theatre was reopened in 1934 as a movie house and in 1940, it became a retail store, and later part of the 50s and 60s grindhouse circuit..
very powerful the first shot... nice historic re-compilation. I love the old... the new, not so much. Thanks for showing us what once was. Wait, wait, wait. They covered it up? Like, permanently? With a BILLBOARD? I thought it was just temp scaffolding over the facade until they finished whatever construction they were doing in the building itself. Gravy. I need to be more observant. Thanks for showing the old pics, I've always wondered what it looked like in its heyday. I'm really enjoying the now/then Times Square shots. Makes me depressed and angry, but! Very interesting changing shots there. Times Square was for dreamers until drugs came in...than it was a slow march into death...the decline was inevitable. It once looked very smart. Now, looking at it, it could be anything. Sad. Very artistic transition of this wonderful landmark! That's a damn shame if I ever saw it! Makes me sick. What a contrast. I'm with V on this one, despite the clever advertising. Ken, you never got inside the skinny building, did you? My mom just passed away and in going through her bookcases, I found a copy of a play written by my grandfather, William Ford Manley, published in 1931. The book includes a copy of the play's program, "as produced at the Times Square Theatre, New York". Steps, Williamsburg, shot by myself.....ha! Signs, Signs, Everywhere Signs ?